A gateway to the coastal region, Mangalore has long served as a stop-off point on maritime trade routes, and remains a major port city today. Family-friendly places like Sri Krishna Temple and Kadri Manjunath Temple will thrill your kids. Venture out of the city with trips to Venugopal Temple (in Manipal), Malpe Beach (in Malpe) and Udupi (Kapu Beach & St. Mary's Island). There's more to do: contemplate in the serene atmosphere at Kudroli Gokarnath Temple and look for all kinds of wild species at Kottancheri Hills. Make your Mangalore itinerary with Inspirock to find out what to see and where to go. Use the Route module to find travel options from your starting location to Mangalore. In May, daily temperatures in Mangalore can reach 39°C, while at night they dip to 28°C. 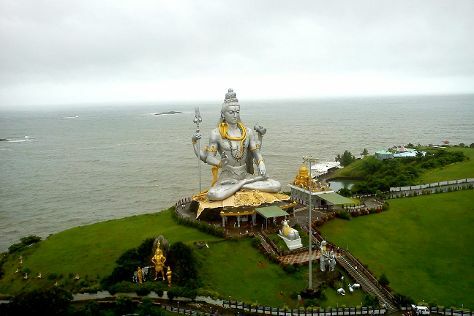 Wrap up your sightseeing on the 19th (Sun) to allow time to travel to Murdeshwar. Your day-by-day itinerary now includes Murudeshwar. On the 20th (Mon), contemplate in the serene atmosphere at Sultani Masjid, stroll around Statue Park, then take in the spiritual surroundings of Kethapayya Narayan Temple, then contemplate in the serene atmosphere at Murdeshwar Temple, and finally stroll through Murudeshwar. To find photos, where to stay, more things to do, and tourist information, use the Murdeshwar sightseeing website . You can drive from Mangalore to Murdeshwar in 3.5 hours. You'll set off for home on the 22nd (Wed).